Who’ll get blamed for this lunacy? Could it affect the outcome in the top betting constituency? The one thing that makes me more furious than anything at the moment is the crazy new law that’s going to impose a hideous regime that will keep adults and children apart. In the name of trying to control paedophiles our stupid MPs have allowed this over-the-top ill-thought out piece of legislation to be passed and now local councils, like Watford, are making their own preparations. Some of my fondest memories from the time my three children were young was taking them down to the park to play in the playground. 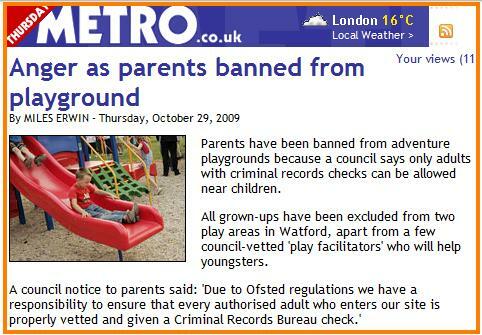 Now future parents are going to be denied this thanks to MPs who failed to realise that their primary job is to scrutinise legislation and councils like Watford that have come forward with gross interpretations. Quite smartly frightened minsters have postponed the full impact of the new regime until after the election. But that’s not going to stop the media finding one quirk after another that MPs, if they had been doing their job properly, should have raised when this was going through the house. Rod Lidddle on his blog is calling for a mass campaign of civil disobedience and is offering a bottle of champagne for the best idea on how this could work. Which brings us to what will happen in the Watford constituency at the general election. This is the three way marginal that Ladbrokes say has seen the most active betting. Could the Lib Dems, who have high hopes in the town and control the council, find that their task has been made harder? HAT-TIP to AntiFrank on the previous thread. William Hill have just told me that they are settling the McNulty bets. Will MORI help us to map a possible Tory victory better? Part of my standard patter whenever I give talks about the coming election is that we are moving into what is almost uncharted territory. Changes of opinion on the scale that the polls are currently showing happen very rarely and, of course, there has been only one change of government in the past thirty years. One of the challenges for those who like betting on and predicting elections is that the only modern polling data that’s widely available online about such a change is from the period leading up to Tony Blair’s great victory in 1997. So almost all of the comparisons that are made are with what happened twelve years when what might be more relevant is the movement in opinion before 1979 general election – the last occasion when the Tories came to power. Some polling data from Gallup from the period is included in the “The Almanac of British Politics” but it’s nothing like as comprehensive as that which we get from Anthony Wells’s excellent UKPollingReport. So it’s really good news that the head of political research at MORI, Julia Clark, tells me that the firm has a project going on to put their 1970s data onto their online archive. I don’t know yet when this will be available but I hope it won’t be too long. An issue, of course, with historical comparisons is that polling has evolved so much that it’s usually misleading to take historical numbers and make too specific a prediction for today. It doesn’t stop people though. Also we go into the next election with two firms – ComRes and MORI – having made major changes to their methodologies in the past eighteen months and a third, Angus Reid Strategies, which is totally new to the UK. 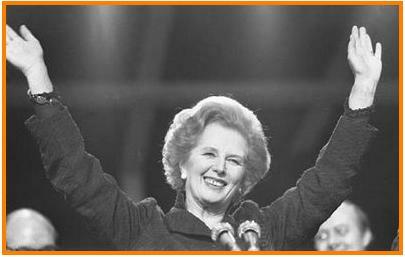 One thing that we do know about 2009 compared with 1979 is that David Cameron is enjoying much better approval ratings than Mrs Thatcher had. Does this mean pay-day for the McNulty backers? 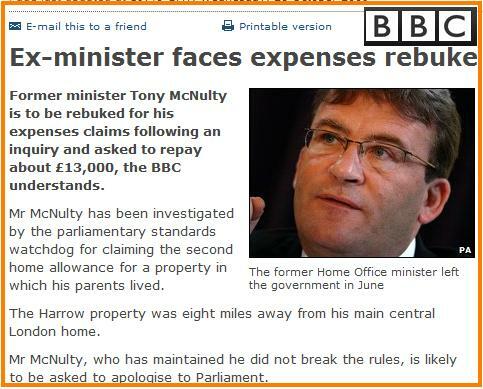 It’s been an up and down eight months for the McNulty troughing backers – those of us who piled into the William Hill market at the end of March taking as much as we could of the 5/1 bet that the former minister would have to pay back some of his housing claims for the mortgage on a house he owns in his Harrow constituency where his parent live. At the end of May, after the Telegraph MP expenses explosion, it was reported that he had voluntarily paid some cash back – an act that was ruled outside of the bet which talked about compulsion. Then, earlier in October, all seemed lost when it was reported that the Sir Thomas Legg report was not demanding that money be repaid. But now tonight it’s starting to look good again – it’s reported that he’s being rebuked and will have to pay back Â£13,000. Oh the ups and downs of political betting. Will Dave pass the November 11 plus test? Can he keep the Tory lead to a minimum of 11%? 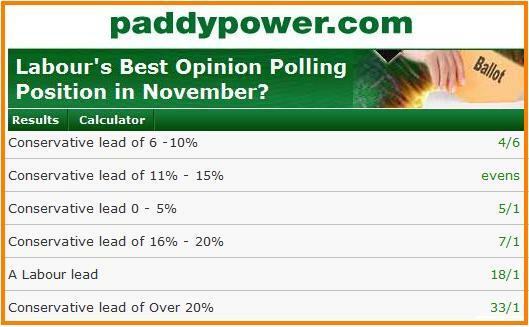 We are nearly at the end of October and time to consider the PaddyPower market on what’s going to happen to the polls next month. Can the Tories sustain a lead of a minimum of 11 points in all the published polls from Populus, YouGov, ComRes, Ipsos-Mori and ICM in November? If you think they can then there’s a not unattractive evens bet available. When it first came out my preference was for the 6% – 10% segment. Now things have changed. It’s hard to see the Tories getting a lead of 16% or more across the full range of pollsters but the chances must be on them keeping at 11% or more. So the 11% – 15% segment is the one to opt for in this innovative new market. What am I doing? Unfortunately because PaddyPower consulted me on it I’m barred from betting. Is Dave out of synch with his party on climate change? Could he be storing up trouble for the future? 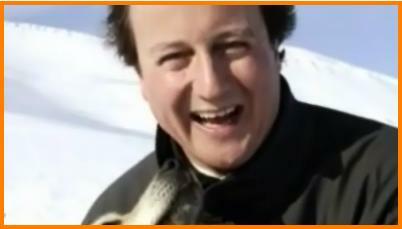 The 2006 picture of David Cameron with the huskies in the Arctic became one of the defining images of the first few months of his leadership as he sought to create a new narrative for the party. Here was a Conservative leader embracing one of the key issues of the day and what better way of making this into a news story than the trip to Norway. But is his view on this issue shared by his party or could he be out of synch? And if he is could that manifest itself into a split either this side or the other side of the general election? A big danger is that the whole Cameron project to change the party is fine when things are going well and it looks as though he is heading for victory. But what if the polling gap narrows and what happens after an election victory if he is pursuing policies which key shapers of Tory opinion, like the bloggers, are uncomfortable with? Maybe Cameron is taking his lead from Tony Blair who managed to pull that trick off with Labour and stay at the helm for a decade. How big an issue is immigration/race relations? 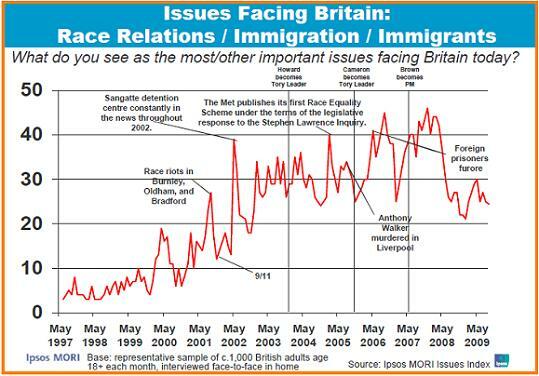 The chart I’ve singled out is, given the BNP and the associated publicity, is on immigration and race relations and shows how views have changed since Labour came to power in May 1997. What’s interesting is that although we’ve just seen something of a dip the trend has been upwards. Just compare the figures from the late 1990s when for three years it didn’t not register in double digits with the concerns today. What’s stands out also are the regional splits. The national average is 24% yet in London it only registers amongst 14% of respondees. Amongst the unemployed the figure is 15% – well below the average and less than half that of the self-employed. The older age-groups – those of 65+ – are likely to be the most concerned while amongst the 18 – 24 year olds only 8%, one third the national average, mentioned this area. 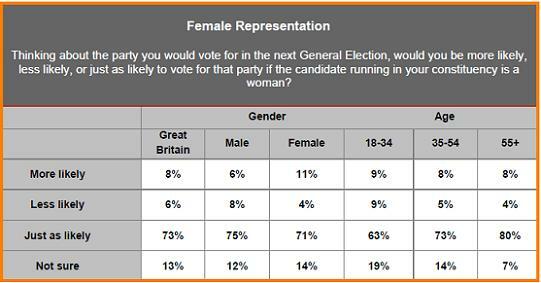 Will the BNP succeed in infiltrating YouGov? Should we be worried about the polling scam?? Reproduced above is part of a page from the BNP website and sets out a scam aimed at both raising the party’s polling numbers and making money at the same time. Wow – it seems too good to be true and I’m sure it is. Such ideas have been floated from time to time and clearly all online pollsters which use polling panels are vulnerable. There was talk of UKIP doing the same thing ahead of the 2004 Euro election. I’m emailed Peter Kellner and I’m sure he’ll tell us that measures are in place to identify and deal with such approaches. As a starting pointing the BNP might have had a better chance of succeeding if they hadn’t first put it on a website that anybody could find within a few seconds on Google. Some people will get through the pollster’s defences but it has a very large list and it’s possible to be on it for months without being asked to take part in a voting intention poll. Should we be worried? No. “.YouGov actively recruits the majority of our panel using a variety of techniques, although self-signup and referrals from other members are also possible. We constantly monitor the profile of new panel members, and track differences in survey results, to ensure that our panel is representative, and to protect the quality and integrity of our data. Moreover, YouGov’s sampling methods ensure that new members who sign themselves up cannot have a statistically significant impact on any YouGov polling results.